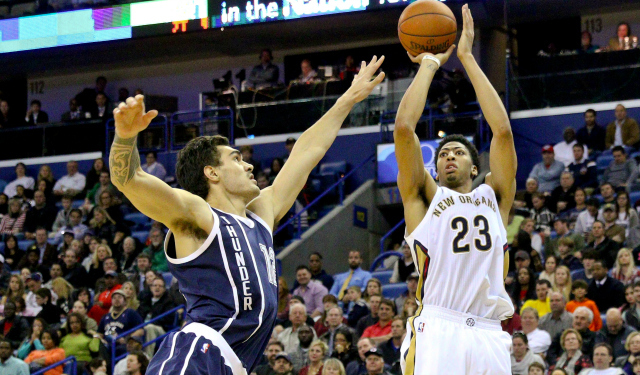 The Pelicans are a great idea that is a complete mess in practice. Why? It’s very simple, everybody’s injured on their team. Right now, their starting 5 for the season opener is gearing up to be Nate Robinson, Eric Gordo, Alonzo Gee, Ryan Anderson and Anthony Davis because everyone else in their lineup is literally injured. I think the Pellies are a playoffs team in the ultra-competitive Western Conference when everybody’s healthy. People don’t remember how good Jrue Holiday is because he hasn’t been healthy in a couple years, but that guy is one of the top 7 point guards in the NBA when the injury gods leave him alone. The Pelicans have no bench whatsoever and newly appointed coach Alvin Gentry is going to have a hard time milking whatever he can out of Anthony Davis. They would normally do the playoffs, but unless Eric Gordon transforms into a superstar wingman, it’s not going to happen.